All praise be to Allah, and may peace and blessings of Allah be upon his Prophet, Muhammad. Allah says very explicitly in His Book, ” (This is) a Book (the Qur’an) which We have sent down to you, full of blessings that they may ponder over its verses, and that men of understanding may remember [38:29].” If we don’t understand the Book, how can we ponder on its verses! 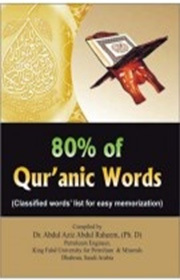 This book presents word lists commonly mentioned in the Qur’an. The lists include nouns, verbs, prepositions, pronouns and more. Be on your way to learn the meanings of Qur’anic ayahs. The main focus of this site is to help you learn and understand the Arabic of the Holy Qur’an.